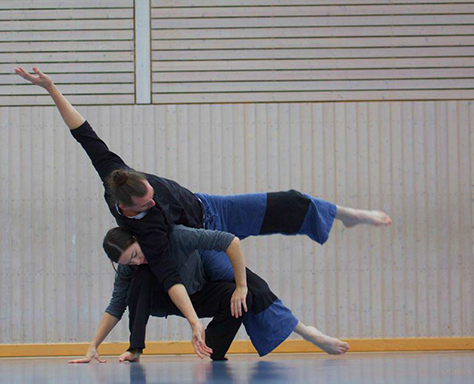 With a strong grounding in contact improvisation, we will experiment with the below three concepts to expand our dancing from the gentle and subtle to the acrobatic and fluidly athletic. Class exercises are strongly rooted in functional anatomical principals that emphasize clarity, momentum and release in order to build the kinesthetic awareness necessary for the dancing that follows. FLOOR WORK: The floor is our first partner. How can we move on the floor efficiently and effectively in solo and with our partners, exploring large, broad contact points and finer ledges at varying speeds? FLUIDITY: Utilizing our full physical volume – including the role of the skeleton – we will explore the flow of gravity and how to direct and redirect momentum within our own structure and with our partners. FLIGHT: With the lightness of laughter we will experiment leaving and returning to the ground, removing the ceiling and any notion of a stopping point in our sense of boundless sky. On a more concrete level, how can we improve our timing to catch the waves of another’s up, meeting them at their peak or joining them in their descent.